Since actinobacteria inhabit a vast range of ecological niches, their life cycle and growth dynamics have been evolved while acquiring different strategies for efficient survival. Of these differentiation strategies, spore (better to be called conidium due to their reproductive nature) formation in actinomycetes, the formation of resting cells discussed earlier in Chap. 5, or the complex cell envelope of Corynebacteriaceae and Mycobacteriaceae to produce more resistant forms of vegetative cells can be named. 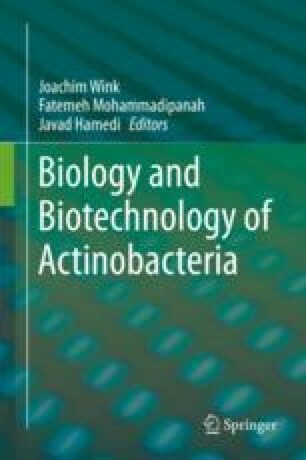 Accordingly, one of the most well-studied bacteria within the taxon is the filamentous actinobacteria (i.e., Streptomyces) for whom the exact true life cycle is presented and the dynamics are well elucidated. However, much more efforts regarding the growth dynamics of other members of actinobacteria are required to fulfill our interest of having a comprehensive insight of their physiology of growth and cell division. Herein, the available data together with recent studies on the growth and differentiation of these bacteria are discussed.